and still everyone loves him. Well, Sybil and I do anyway (after taking legal advice). But I digress. As well as hosting TV programmes Mr Wallace is also part owner of Secretts, who supply fruit and veg to the restaurant trade, and out of that has sprung a deli/café, Wallace & Co, which has just opened its first branch in Putney. I say first branch because that’s what it felt like – a model for future Wallace & Cos.
My visit was not planned as I’d wanted to have big slap-up lunch of Fish and Chips in a nearby venue, but as that proved more of a slap-in-the-face (post soon come) sort of experience I needed a little cheering-up. And, Wallace & Co more or less did the job. The first thing to say is it’s not really a destinational sort of place – more somewhere you would pop into if you fancied a quick bite. 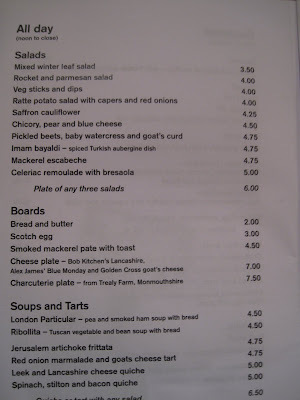 During the day there’s a selection of salads, soups, pies and tarts. In the evening there’s a few additions to the menu in the form of protein + starch. There’s a lot of competition in the area including the excellent Prince of Wales next door so it will be interesting to see how popular the evenings are. Prices appear pretty keen but portions aren’t massive and dishes are very to the point so you’re going end up ordering quite a few plates if you do want a substantial meal. Quality is good though as in my Charcuterie plate which had meat from Trealy Farm in Monmouthshire. 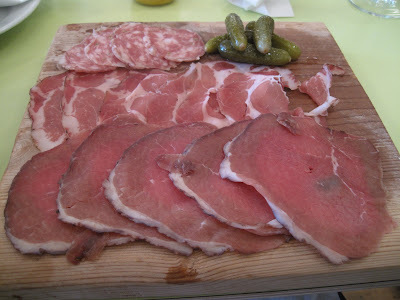 Salami, Coppa and Bresaola were all excellent and served properly, at room temperature. 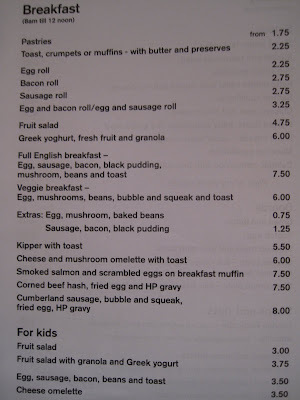 Anyone who’s anyone does a Scotch Egg these days with wildly varying results and prices. 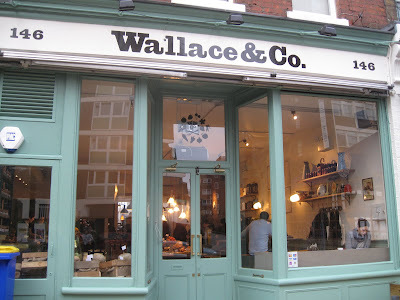 Wallace & Co’s version was very good. It was warm which meant it was, if not cooked to order, at least cooked recently. It was cut into quarters, presumably because cut in half or served whole it would look pretty stupid on the piece of flotsam it was served on. It had nice porky meat but was also quite small - no more than a few bites – but at least it didn’t cost £7. 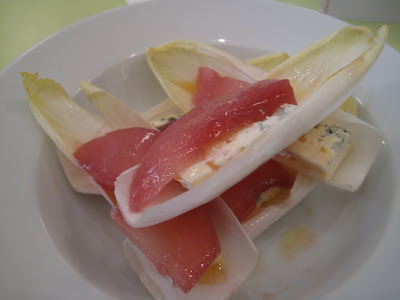 A salad of Chicory, Pear and Blue Cheese was a good idea, not least because you could use your hands to shove the leaves (deeeeeep) into your gob. The dish didn’t quite come off though because the Pears, although quite perfumed, weren’t sweet enough, and the Blue Cheese wasn’t salty or, er, blue enough. Comice Pears and Colston Bassett would have worked a treat here. 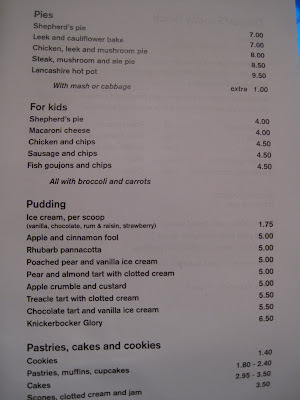 I’m told Greg likes his puddings and sure enough there’s a fair number to chose from on the menu. 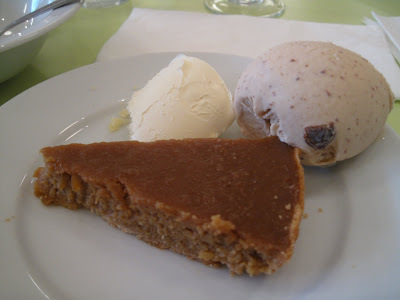 Treacle Tart was good but would have been even better served tiède. The serving was on the wrong side of mean but maybe that was just me being greedy (I’ll rephrase that: that was me being greedy). I had it à la mode, obviously. With a few alcoholic drinks of various hues, good coffee and a decent gratuity for the friendly service, the bill was probably more than it would be for normal human beings but just right for a Hermano, especially one who was wet, miserable and hungry. Never was a tip so well earned. I am sure that you have purposely dangled the invitation to add to your all-too-brief list of why people dislike Mr.W! So, here's my addition- he just repeats whatever the "real" chef(torode or roux) has just said when making a comment. As Wallace was away when you went....is the title of yr write-up (a quick one while he's away) a reference to the WHO's album of the same name(and main song on the album)? As you have a reputation for using rock songs in your write-ups. Any sign of Danny Dyer there doing a special feature for Bravo? that's the sort of place i wouldn't mind in my neighbourhood. 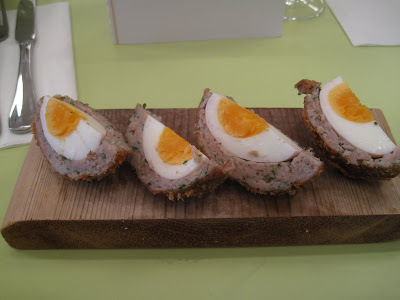 3 quid for scotch egg, 7.50 for the charcuterie, and 2.50 for veg sides is pretty decent i think. i think gregg is liked, he comes across as a decent guy. it's the fact that masterchef introduces him as an "ingredients expert" and that his comments are pretty daft that grates slightly. like the look of his caf though. oh god. went to this place on the weekend...absoute joke. 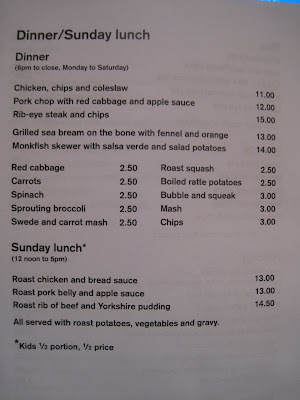 comedy of errors in service, poor quality layout and mostly unexceptional food. just another z-list food celeb trying to cash in on his "it's me off of the telly" fame. Hi Nick, Fixed. People don't like him much do they ? Personally, I think JO is much worse. The similarity with the Who (?) was a happy coincidence. Anon 1 - DD and Greg Wallace ? Do what? Tasty, very tasty, and a bit nawty. Good to have them in the firm if it all kicks off. As it could do in a Putney deli/cafe. Anon 3 - I write as I find. Service appeared a bit dippy but I got everything I ordered in a reasonabe time and everything I ate was good. That said most stuff was assemblies or precooked so I can't really pass judgement on the cooking. It's only short-order stuff so they shouldn't screw up really. Cash-in ? Probably but so long as I get food I like I'm not bothered (JO aside). If they don't come up to scratch then it's so much hubris and they deserve all they get. here's a question..., what is the coffee like then? Going to a cafe is not just about food, but also about the everlasting feeling of satisfaction that you get from a very well made coffee. It should be about the whole experience, not just a part. Coffee is a very important and as a 'masterchef', I am wondering if Mr Wallace has thought of it. I’ve been to Wallace & Co. for a 3rd time thinking I would give them a chance to redeem themselves for the first 2 fiasco experiences, just to face another disaster. By far the worst service I’ve ever experienced in a restaurant or even cafe. 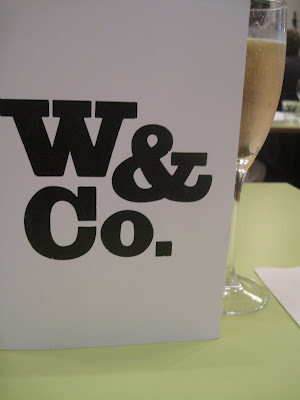 My first bad experience at W&Co. was when I took 11 friends for a Sunday brunch and they managed to get 11 out of our 12 orders wrong, not to mention that half of the food arrived when we were about to pay the bill and a few dishes didn’t even turn up. Service was just chaos. I decided to give it another go, this time on a quiet Tuesday evening. I was shocked after having ordered our food just to be told 30 minutes later that they didn’t have one of the 2 dishes ordered. My partner’s dish arrived at the same time they informed me they did not have my fish and I should order something else. What a shamble! Third and final straw, I thought, well, they can’t get a coffee and cakes wrong, right? WRONG! They managed the unthinkable! I went for a coffee and cake on a Sunday afternoon. On arrival I placed my order for a coffee, tea, scones and a slice of cake. After at least 20 minutes waiting we finally had our coffee and tea, with a tea bag inside and milk but no cutlery to remove the bag or a place to dispose it. No sugar or sweetener was on the table or offered, we decided to stand up and pick up a sugar pot ourselves after waiting for a while for attention of one of the careless or shall I say lost untrained staff. 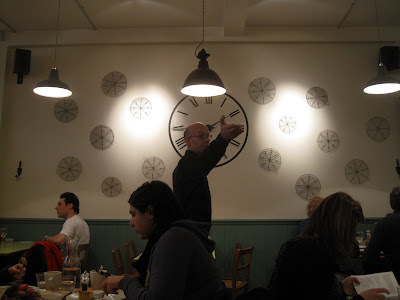 After having finished our coffees and tea, we decided to ask one of the staff for our scones and cakes ordered 40 minutes earlier only to be told that the scones have finished long before lunch, hours before we arrived. They apologised for the mistake and went to fetch a piece of the wrong cake - not what we ordered. I think you can make your own conclusions after the above! I never thought a well known chef like Greg would risk putting his name into such a shambolic restaurant. Definitely not a Masterchef's standard! What a shame, I really liked the concept and was looking forward to something like it in Putney.